CARACAS, Dec 6 2017 (IPS) - Hate speech in the media or social networks in Venezuela is now punishable with prison sentences of up to 20 years, according to a new law issued by the government-controlled National Constituent Assembly (ANC). “A laudable objective, such as preventing hate speech that can lead to crimes and other damages, creates new crimes of opinion and is aimed at controlling content and freedom of expression,” Marianela Balbi, executive director of the Venezuelan chapter of the Lima-based Press and Society Institute (IPyS), told IPS. 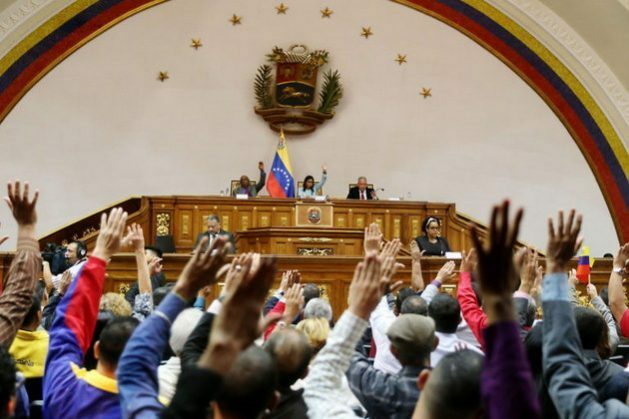 The “Constitutional Law against hatred, for peaceful coexistence and tolerance” was approved by the ANC, which is made up exclusively of supporters of the government of Nicolás Maduro. The ANC was elected on Jul. 30, in elections boycotted by the opposition. It is not recognised by many governments, while the single-chamber National Assembly, where the opposition is in the majority, rejects it as unconstitutional. “We do not call it a law because laws, in accordance with domestic and international human rights law, are made by parliaments – in this country, the National Assembly – to allow debate and participation, which in this case did not happen,” Carlos Correa, of the non-governmental organisation Espacio Público, dedicated to freedom of expression and information, told IPS. It was President Maduro, in power since 2013 and political heir of the late leader of the Bolivarian revolution, Hugo Chávez (1999-2013), who requested the approval of the law against hatred. “The time has come, through a broad political process of awareness-raising, to punish the crimes of hate and intolerance, in all their forms of expression, and to put an end to them definitively,” Maduro said when presenting the bill in August. * Before the law was passed, 14 people were imprisoned in the last three years, some for several months under ongoing judicial proceedings, for sending messages via Twitter, investigated as accessories to crimes committed in the context of opposition demonstrations, human rights organisations point out. * The Press Workers’ Union reports that in 2010, 49 media outlets were closed in the country, including 46 radio stations. Espacio Público counts 148 closures of media outlets during the governments of Hugo Chávez and Nicolás Maduro. * Espacio Público registers a record number of 887 violations of freedom of expression in the period Jan.-Sept. 2017, 259 percent more than in 2016. The list covers hundreds of intimidations, attacks and threats to press workers, especially in the context of demonstrations, as well as 83 administrative restrictions on media and 157 cases of censorship. * The Internet connection speed in Venezuela is 1.9 megabytes per second, comparted to a regional average of 4.7, according to the Economic Commission for Latin America and the Caribbean. * The International Telecommunications Union records a decrease in the population's access to Internet, from 61.9 to 60 percent between 2015 and 2016, and a decrease in mobile phone coverage from 102 to 87 percent between 2012 and 2016. Former minister of Foreign Affairs and president of the ANC, Delcy Rodríguez, said that a comparative study was carried out with similar laws in Germany and Ecuador, and that in addition to establishing penalties, the Venezuelan law incorporated provisions to promote education in favour of tolerance. In July, Germany passed a law that orders service providers such as YouTube or Twitter to remove content considered criminal within 24 hours. In Ecuador, former president Rafael Correa (2007-2017) proposed a “law that regulates acts of hatred and discrimination in social networks,” with possible sanctions against service providers, but the legislature shelved the bill after Lenin Moreno became president in May. “It is serious that this law puts in the hands of a few officials the assessment of what is or is not a hate crime, because the legal instrument lacks a definition,” Alberto Arteaga, former dean of the Central University of Venezuela’s law school, told IPS. Political organisations will have to reform their statutes to expel any members who spread expressions of hatred. The penalty for not following this rule will be the cancellation of the registration of the party considered to have infringed the law. Any print or audiovisual media outlets that emit messages punishable by law will be subject to fines, closure or termination of their concession, independently of the penalties that may fall individually on those responsible. Administrators of social networks and online media outlets must withdraw messages that contravene the law within a maximum period of six hours, or they will be sanctioned. The penalty for spreading messages that instigate hatred, war, discrimination or intolerance can range from 10 to 20 years in prison. The sanctions will be imposed by courts and by the state National Telecommunications Commission. In addition, the law creates a Commission for the Promotion and Guarantee of Peaceful Coexistence, which will dictate the measures that the authorities and official agencies and citizens must follow to fulfill the objectives of the law and avoid impunity. The new 15-member Commission, appointed by the ANC itself, will be made up of representatives of that body, the executive branch, the other branches of government, excluding parliament, and three social organisations that promote coexistence. But the decisions by the parliament elected in December 2015 are systematically blocked and ignored by the Supreme Court of Justice, the executive branch and other Venezuelan authorities. The new law, which entered into force on Nov. 8, has not yet been applied to any institution or person.